Injections for knee pain relief are usually administered only for knee pain caused by arthritis, since other types of knee pain are better alleviated by methods such as physical therapy, braces, compressions, or surgery. 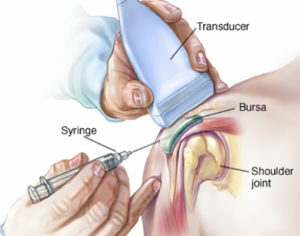 Injections into the knee are performed in an office setting. It is not necessary to have x-ray assistance with the injections as the joint is not far from the surface of the skin. Oftentimes the surface of the skin is numbed with a spray, and then some numbing medicine along with a corticosteroid, which is a strong anti-inflammatory medication are injected just under the skin. Once the needle is inside the knee joint, the doctor will often aspirate fluid from the knee in preparation for putting the numbing medicine and injection material back into the joint.